Ramona J. Forkner, age 89, of Carterville, Mo., passed away on Tuesday December 26, 2017, at Communities of Wildwood, following an illness. Ramona was born on August 8, 1928 in Seneca, Mo., the daughter of the late William and Freda (Kidwell) Eddings. She was the oldest of seven children. She has been a lifetime area resident. She married Glen Fort in Miami, Okla., and together they had two daughters. 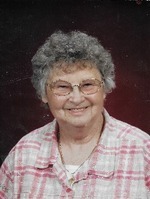 She was a member of Carterville First Baptist Church. She worked as a Ward Clerk for St. John’s Hospital for many years. She enjoyed sewing and crafting. Ramona married Jess Forkner on June 13, 1968 in Joplin and he preceded her in death in August 2003. She was also preceded in death by two step-sons, David and Darrell Forkner. She is survived by two daughters, Carol Myers and husband John, Carterville, Mo., and Cheryl Franklin and husband Pat, Tunis, Mo. ; one brother, Joe Eddings and wife Roxanne, Kansas City, Mo. ; four grandchildren, five great-grandchildren; several step-grandchildren and step-great-grandchildren; and several nieces and nephews. Graveside services will be 11:00 a.m. Friday at Ozark Memorial Park Cemetery. Reverend Darren Wallace will officiate. The visitation will be 10:00 a.m. Friday prior to the service.